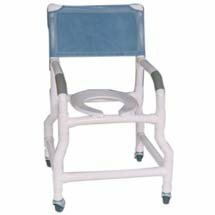 PVC Shower Commode Chair w/ Stability Base by MJM International is made of 100% Virgin PVC material. Deluxe, elongated, extra heavy-duty, contoured open front seat. Fast drying, removable mesh back/sling, comes with personal pocket/pouch. PVC pipe and fittings come with Built-in Stabilizers that inhibits the growth of bacteria and fungi. 18" Internal Width. 22" External Width. 3" x 1-1/4" Threaded Stem Casters for additional safety. 40" H x 22" W x 18" D. 21" Seat Height. 300 lb. Weight Capacity. Made of 100% Virgin PVC material. Deluxe, elongated, extra heavy-duty, contoured open front seat.